THE STORY - A mysterious madman rounds up a group of victims to play sadistic games of life and death. Police soon find evidence that link the crimes to Jigsaw, the infamous killer who died 10 years earlier. THE GOOD - They use the same cool theme song that is used in all the others...so that's pretty cool? THE BAD - Everything else. The acting is too dramatic and over the top, the dialogue is pointless and expository. The direction is messy and incohesive. A train wreck that you want to look away from but simply cannot. ​Step aside "Transformers," there's a new excruciatingly painful franchise in town. The Spierig Brothers' "Jigsaw" is a horrendous train wreck that you want to turn away from but cannot bear to miss a single moment of the horror. There are bad movies, there are awful movies, there are atrocious movies, and then there is "Jigsaw." Digging the franchise to new lows that originally were not thought possible, the film fails on just about every front. The acting, the script, the direction, everything. The only redeemable quality is the outbursts of laughter you will experience when you realize "I'm an hour into this mess and I have absolutely no clue what is going on." As bodies begin turning up in the city an investigation is launched to figure out who is responsible for these grizzly deaths. The investigation is led by Detective Keith Hunt (Clé Bennet) and Detective Halloran (Callum Keith Rennie). Our two detectives are disturbed by the alarming rate these bodies are turning up and will stop at nothing to discover their killer. Logan Nelson (Matt Passmore) and Eleanor Bonneville (Hannah Emily Anderson) are the two coroners responsible for performing autopsies on these mutilated corpses. The coroner's autopsies lead to them discovering multiple confusing pieces of evidence. The strange part is that all evidence points to one man; John Kramer (Tobin Bell) who is otherwise known as the Jigsaw killer. The even stranger aspect is that John Kramer has been dead for ten years. God, I had terrifying flashbacks just describing the plot. From the moment this film begins it is destined to fail. The story moves at such a ridiculous pace that there is never any form of momentum, tension, or passion. The emotional moments do not feel real and the moments of tension are made to seem tense by the loud guitar riffs in the score and the loud sound design of the traps. 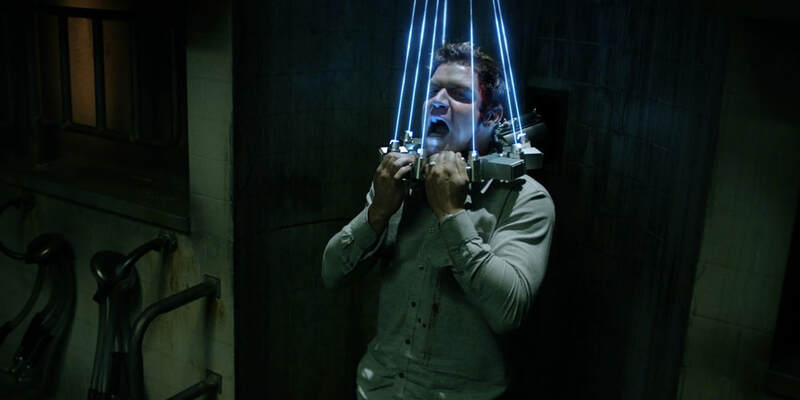 At a time when the "Saw" franchise succeeded in jumping back and forth between multiple stories, this installment throws all of that out the window. "Jigsaw" jumps between the investigation being launched against the murders and a trap that is currently happening with five participants. Since the film cannot make up its mind for whether it wants to focus on the horrors of the trap (Like the later films in the franchise) or the detective story (Like the first installment), it simply gets caught in the middle of its own ridiculous approach. We never spend more than maybe five minutes with a single character leading to absolutely no character connection what so ever. Instead of attempting to focus on the ensemble as a whole as previous films in the franchise did, it instead just kind of weaves its way from one line of dialogue to the next. None of the actors seem to be actually acting as they are just reading their lines from the script and then occasionally yelling. The film never takes the time to fully develop the story at hand either. The writers and directors just kind of threw a situation in our lap and said: "Hey, watch this unfold." There's no rhyme or reason for any of the events and there certainly is no emotional connection to the events. Now while the scenes in the film just kind of start and end, there is a whole separate conversation to be had about just how ridiculous some scenes are. To start, a lot of the traps are not that original or enticing. At a time when the Saw films would petrify audiences by just how complex they were, this project seems to take not one but a few steps back from that. The traps are simply a smorgasbord of different torture materials thrown at the characters in a hope that it will strike some sort of fear into the audience. From trying to drown some characters into wheat grain which then leads to blades falling towards them. To having to inject the correct antidote into someone so that none of the characters end up getting hung. No tension is built through the traps because they simply aren't anything we haven't seen before. But after you realize you aren't being frightened by the gore fest happening before your eyes, you come to a revelation that the film is just downright bad. The screenplay is a mess from start to finish. Not only does it not tell our story in a cohesive manner but some of the events are just idiotic. From a man being put into a coma, woken up forcefully from the coma, then placed in a casket that was previously buried only to be re-buried, need I say much more? But on top of that, all of the lines of dialogue are completely ridiculous. The characters just speak in pure exposition that only further the amount of un-enjoyment you will experience watching this film. "Jigsaw" is quite possibly the worst film of 2017 so far. Now I cannot speak to whether it is on par with something like "The Emoji Movie," but I'm sure it comes pretty damn close. From ridiculous character speaking in strictly exposition to just a sheer mess of a screenplay, the film is doomed to fall flat from the very beginning. Giving a bad name to an already lukewarm franchise, "Jigsaw" does not offer the sort of revival it seems to be striving for. There are certain horror films that are absolutely terrible and it, in turn, becomes an amazing viewing experience, this is not one of those films.